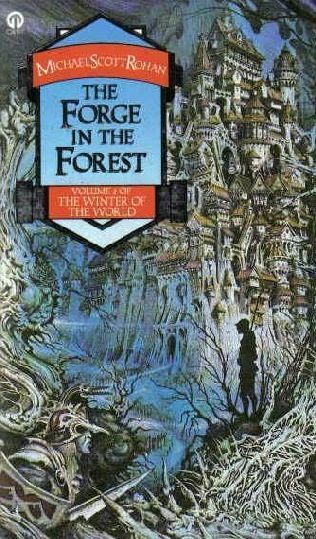 The Forge in the Forest is the second book in a 6 book series by Michael Scott Rohan. After being pleasantly surprised by how much I still liked the Anvil of Ice, I started out on book 2. Like the first read through I have found both these books the type where you stay up late to finish a chapter. Not helped by the chapters being 30+ pages and the layout such that not many pages end on the end of a paragraph or other text block. The book begins with the aftermath of the attack on Kerbryhaine by the Ekwesh. Court politics abound with eventually a quest to head east, to try and find other people and safe places in the area the Northern and Southern people had originally migrated from. They encounter more powers, Elof is elevated to Master Smith after yet more fantastic descriptions of the smithing process, this time of electroplating and takes the name Elof Valantor. They encounter a sort of fountain of youth area. Battle more beasts near the ice. the entire story is far more mythological than the previous. More encounters with the Powers – large and small, good and evil, new to the reader and already known. A quest to an area neither the characters or the reader are familiar with. Elof also learns more about the powerful artefacts he previously forged whilst going through his apprenticeship. The end feels a bit rushed and not very well set up. This unfortunately lets down the book a great deal. The resultant information you learn about the worlds backstory and interconnectedness of the people manage to salvage what would have been a poor ending though. Still a good book and difficult follow up. I was surprised that it was as enjoyable as I remembered and regret this being only my second read of it. I don’t know anything about the political beliefs of Michael Scott Rohan, so this whole series may be some sort of Germanic racist fantasy about the good people being under siege from barbarian hordes. This book however puts a large emphasis on the devastating effect of the climate change of an ice age. Written around the time Global Warming models were first seeping into the public consciousness but before either Al Gores documentary or A Song of Ice And Fire became the massive public face of climate disaster it is a snapshot of a pretty unique time. One excellent passage following the desolation at Kerbryhaine was as the party leave the city. They pass through encampments of refugees from the north, around abandoned farms. This makes me think that Rohan is more concerned with the effect of the disaster on the people and how society should band together in times of crisis. If there is any political analogy from real life in the books it is surely that. …the Refugees. They had made their pitiful camps of tent and shack there on land that should have grown food to help support the city. … But the blame was the city’s. Much waste could have been avoided, if it had accepted the northerners and made use of their willing labour, instead of branding them beggars. The thought angered Elof. … It was long before they passed the last of the little camp-fires, but longer yet before those fires faded from his thoughts. The first book has the ice as a horrible looming wall to the north, and which I remembered when first going through Ice and Fire as a similar description. The second book however definitely portrays it as a slow malevolent power with a conscious considered effort to overrun mankind and civilisation. Whilst Ice and Fire can be read as the 7 Kingdoms rearranging the deckchairs as the real threat of climatic and violent murder make their way from the North, Winter of the World has an evil consciousness in league with evil vikings and minor gods to try and destroy men and all living things. The destruction of ancient cities discussed in this book show the threat of the inching ice is just as real as from a rampaging army. The book is definitely worth reading if nothing else so the reader can contrast to George RR Martin.